Applications have evolved to be highly dynamic and multifaceted, blurring the line between legitimate business applications and those that waste time and increase a company’s exposure to Internet-based threats. In the past, acceptable usage was relatively clear-cut, but social media, file sharing, and Internet communications applications have evolved to serve just as many business use cases as strictly personal ones; these applications are now widely used throughout all levels of an organization. Further complicating the situation, today’s workforce is becoming increasingly mobile, with users requiring anywhere, anytime access to the network from a variety of company-owned and personal mobile devices. This has prompted businesses of all sizes and types to embrace “bring your own device” (BYOD) policies to increase employee productivity and satisfaction. To learn more. 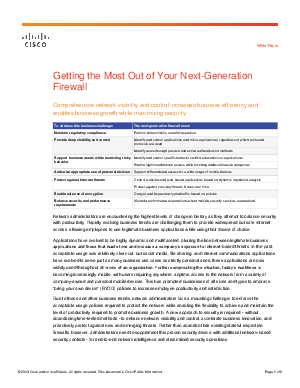 Download this whitepaper, compliments of Cisco.